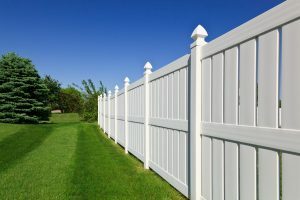 So, here is a guide to follow whenever you need to work with the vinyl of your next fence. Are you interested in having a vinyl fence protect your yard? In that case, you should know that you might need to trim it down to size. This is because the panels might not be the right size. So, here is a guide to follow whenever you need to work with the vinyl of your next fence. First of all, you need to measure the vinyl panels. Before you can do anything else, you must compare the length of what you have against what you need. Walk out into the yard to the spot where the new fence will go with a tape measure in your hand. This way, you can evaluate how tall the fence the fence needs to be. The posts that hold the fence up need to be set deeper into the ground than the posts you would use for a wooden or metal fence. Use some chalk to mark the lines where you’ve got to cut. Make sure you have a half inch extra, leaving room for rail hangers. The second step is to prepare the cut. Using a saw is your best bet, but you need to be careful, because the vinyl will shake as you slice through it. This means that the vinyl is more likely to crack apart. To stop this from happening, you need to keep the vinyl secure with some wooden planks – 2x4s. Now, you can start to cut the vinyl down to the size you need. Make sure the blade meets the chalk lines that you drew earlier. Keep your hands away from the blade before starting it. Wait for the blade to reach full speed, and then guide it down to the surface of the vinyl. Stay steady and don’t let the blade slip, go slowly and cautiously if you have to – once all the vinyl panels are the length you need, you can go install them. This entry was posted on Friday, January 25th, 2019 at 4:40 pm. Both comments and pings are currently closed.